Last night you nursed for very long and you refused to go to sleep. But Mommy was already tired of being in nursing position. You were unsatisfied. You wanted to be coddled. So mommy brushed your hair and sang you “My Sunshine”, because Mommy is Daisie’s “my sunshine” and Daisie is Mommy’s “my sunshine”. I took your hands and you placed them in front of me. I gave you your bolster but you refused. You wanted to hug my hand instead. I gave. With a subtly cracked voice, I sang to you. You closed your eyes and held my hands with your tiny fingers. I could feel love. I hummed and stopped, and there you were, softly asleep. Just a post to remember how we celebrated Daisie’s 2nd birthday – at school this time, with her friends and teachers. There you were, putting your cheeks at mine like you knew that I loved it everytime you do that. 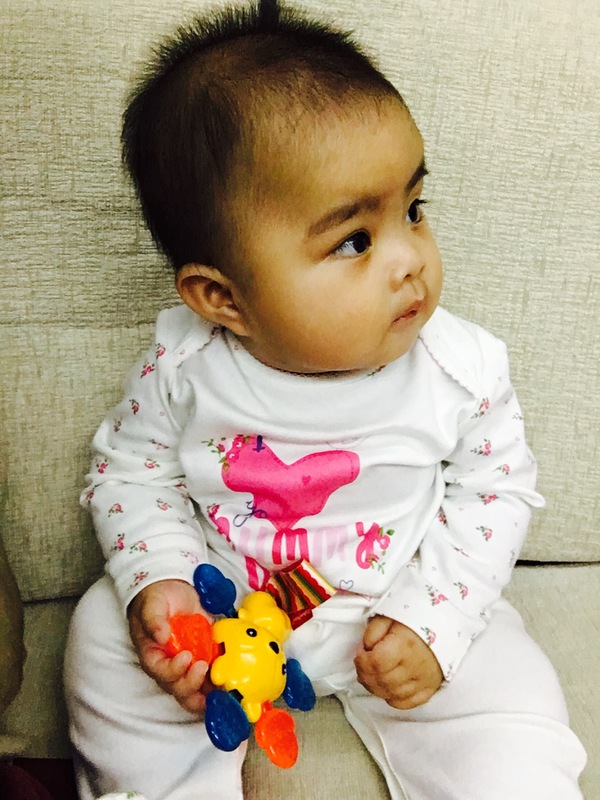 Grow up to be a kind and a loving person, my dear Daisie. Those are the firsts values that you need to instill, as with kindness and love, other things will come too. Mommy and daddy love you so much. Starting of this post with a photo of The Duo in my parents’ place. Daisie and Axel both chilling on the stairs. Everyone was back (except for my hubby because he was supposed to fly outstation for work) and as usual when the sisters are all back plus the children, the house became merry. So much noise, laughters (and cries too) and most importantly so much food! Since it is still the durian season, dad bought us so much durians that I am actually getting a little bit sick of it (but still chugging them into my throat though!) because who could say no to durian? Haha! Durian fiesta! My favorite is still the kampung durian. Lemak! On Saturday noon when we just arrived, both babies went to their paed’s clinic for their scheduled jab, the routine screams and shoutings of course happened as usual (but was very quickly settled after being bribed with cute stickers) haha! Later in the evening, we went to mom’s favorite restaurant to have the promised dinner (we had 2 betting sessions during the World Cup fever, one was Brazil vs Belgium which Brazil won and the other one was France vs England which France won – so the losing team had to buy dinner first session at Starview and second session at Pusing! Of course yours truly is in the winning team for both!). Sunday came and my second sister had to go back, but my third sister stayed till Thursday and I till Saturday. I was initially supposed to be attending a wedding of a dear friend, with Daisie and my husband, but we had a change of plans as my dear hubby is outstation and it means that he had to drive all the way back to BM to fetch us to the wedding, then down south to fetch us back and then back up north for work. (Perks of a LDR hmmph…) so no more wedding. Which was fine, because we see the married couple all the time anyway. Haha. So this week has been so fun for Daisie because she had her EeEe accompanying and playing with her. Most importantly is that this whole week of me being with her, I could see that she has learnt a lot of new things that I have not realized. So must put it down! She could say “I want” when she wants something. She could catch the ball when it is slowly thrown to her. She loves sour! She finished my sour plum when I couldn’t because it is too sour. She loves to role play with her little TsumTsum figurines and toys. She knew how to play tea party with her toy teapot and cups. She remembers things very quickly and she applies it to her routine. For example, she would want to throw her diaper in the rubbish bin, put her dirty laundry in the laundry basket, throw out the water from the tub when we are done bathing and clean up her toys whenever told. She could say “good night ; thank you ; bye-bye ; see you ; grandpa fixed! ; and some other words like cat, dog, and ah so much more! She knows how to tell how such animal sounds like. My girl who loves the nature so much. We had fun and its genuine because we are with family. My godmother bought a giant teddy bear as a gift for Daisie, Mimi named it Googoo Bear. It’s big and pink and Daisie love it so much. How do you deal with demises? I’ve heard of a horrible news. A best friend of ours (a nice woman we used to be so close with when we were in France) lost her husband to a fatal accident. Innalillahi wa inna ilaihi rajiun. May he be placed among the righteous. To hear such news in such early morning is really saddening, and it makes me re-think of the existence of life, all the time. Last week, we had someone close passing away too. My husband’s granny’s cousin who has turned into her sister and a very close friend, passed away. What do you tell to these dear ones, when their loved ones pass away? Do you tell them to be patient, and why do you even tell them to be strong when it’s such a hardest test of all. I can’t imagine, and I won’t wanna imagine if demises like this happen to me. 😦 It would be so horrible, and I would be so traumatised and so saddened, and there will probably be absolutely no words coming out of me. Still, I do hope and pray that my best friend, Ilani, will still be as strong as she could be. And I hope and pray that every one will be able to have patience to endure this hardship, and may Allah really replace their lost with betterments. This picture was taken during your wedding day. Years have passed, and our gaps have widened. But never a day in my life you’re absent from my thoughts. If there’s somehow a way I can tell you that I’ve missed you so much and that you’ll always be in my heart, I will. But I’ll wait a little, to tell you that. I love you no matter what. – I guess everyone would have said this before, regardless if it’s said to their partners, parents or like in my case, my dear daughter. I do love her, so much, no matter what. But at the same time, being patient (for the umpteenth times) is just so difficult. Babies might have their tantrum but parents do too. Like today, my anger was passed to Little Daisie – I was mad at my dear hubby for playing his games on the phone and Daisie almost fell from the bed while I was cleaning up after bathing Daisie. (Why do all men play games anyway?) And when Daisie shows her tantrum, ahhh… that’s just the right time for me to scream, shout and sigh out loud. Being a mother is by far, the most difficult task that I have ever needed to do. Nevertheless I love being a mother especially to Daisie and having her in my life has changed me so much. One of my ex-students told me that she has foreseen that I will not be a mother that soon, but seeing me being submissive to my little one was such a shocking sight to her. Being a mother changed my priorities… Daisie will always be put first in line, where as my husband who was once numéro un is now numéro deux. Having Daisie in my life showed me that I could love someone more than the love I thought I had for my husband. Eternal and unconditional. Mommy loves you no matter what. This year’s Ramadhan is a whole new level of challenging month, and very different from the previous years of Ramadhan. It was my 4th year observing the fast and the holyness of the month although I think I might have not gained as much benefit as I’ve gained during the previous years. Last year especially since I was pregnant, I was not able to fast most of the time because of dehydration and fatigue plus whatnots – and also merely because I was still a teacher and I was using my energy and voice to teach / talk / think. It was hard, with the stuffs I would have to carry to school and back everyday. This year since I was not working anymore, I thought that it would definitely be easier but it definitely was not – breastfeeding. But who would have thought that I managed to fast. The first week although, I had fever and flu I guess from the fasting so right there I had to miss. There definitely are opinions stating that we don’t have to fast (mothers – pregnant or breastfeeding) and we just have to feed the poor not even have to make it. Anywho, it was indeed my fourth year and being a little weak to fast has drawn so much judgement to this self. Example, said things like how an adult has to manage fasting because of it’s physical being able to, how when I didn’t fast and it is something to be embarassed of, or maybe the fact that I missed some days is a huge deal for some. But even if it is sinful, isn’t it supposed to be a problem between you and Allah? This year worst still, I did not manage to pray tarawikh even once. I had to take care of Daisie, well it’s not that I am using her as an excuse to not fast (I could have done tarawikh when she is in deep sleep say around 1am to before Fajr) but I got tired too and had to wake up at 4am to prepare food for sahoor (and am not using that as an excuse for not performing tarawikh! And tahajood! Omg). But having people surrounding telling me things like “hey no fret, it’s ok” / “you’re awesome because you put your husband and baby first before you” / “let me buy you coffee just so you can feel better” is so cool (even it’s just a quote / post e.g. from Sh. Omar Suleiman or NAK). At least it made me feel good. Rather than those telling me how others can do so can I.
I wanted Ramadhan to end because I couldn’t do much and I was constantly tired. But at the same time I want it to be Ramadhan all the time because of the rewards. Positively, don’t fret. Cause we’re not alone in this. There’s definitely Allah who is with us all the time, and please if there are other mothers out there who feel the same, please do say hi. We are so in need of supports yo! Today (or I rather say lately) things have gone really bad for me and thus worsen my anger management. Today was such a bad day that I hope it will never happen again anytime. I attended my students’ graduation at school today, and we had a really great time gathering, talking and taking pictures. We were supposed to have dinner together after maghrib at Decanter, but the ceremony ended early so I decided to drop by at my sister’s after the graduation to bathe Daisie and rest for a bit and go to Decanter at 6pm to be able to reach by 7. I should have known, that the traffic will be extra mad at that hour as people would be rushing home from work to make it for iftar but I didn’t expect for Daisie to be that cranky because she is always calm and she would always sleep in the car. But she didn’t. She cried so much and so loudly for such a long time and I was under this stress that if it prolonged and I didn’t find a way out, I think I would ramp into cars! The traffic was efffffing bad. And Daisie kept on screaming and I kept on screaming at her and she screamed back with so much tears rolling on her cheeks and I panicked, at the same time screaming I felt guilty but she kept on shouting so I was really under a lot of stress! It was the worst. I couldn’t describe how bad it is but it was very bad. Horrible. The worst day of my life. The worst things I’ve done to Daisie. Worst. So what happened that I didn’t ramp into cars? As usual when there’s traffic jam in Malaysia particularly Kuala Lumpur on the Federal Highway during working hours both direction (if you read this you better off avoid this damn road), cars will always use the emergency lane and police will always be on standby at the emergency lane to catch these buggers. I figured out that I’ll use the emergency lane and go as fast as I could to reach a place I would stop, and if there’s police, I’ll tell them that I need to nurse my baby. Little did I know, cars tried to go into the left lane because there were legit police cars on standby. I screamed again with my emergency lights on, like “move away!! I’m on emergency here!! !” I drove all the way and stopped right in front of the police. Well he saw my car and he gave me a weird look and I guess he figured that I’m really on emergency. I winded down my window and it just happened that I cried and told him could you please let me nurse my baby she’s very hungry. The man could see Daisie crying so he let me, not only that he actually told his colleagues so that they won’t bug me! I quickly carried Daisie out of her seat and put her onto my arms and there she was… suckling and snuggling into my bosom and I felt a relief. A guilty relieve but I was also thankful to be able to have her in my arms. Eventually Daisie nursed till she slept and I almost wanted to tell my students and ex-colleagues that I’m not making to the dinner and I wanted to have Daisie sleeping in my arms forever there. Hahaha. A few mins after she slept, I placed her on the seat but she refused to so I carried and sooth her a little till she got well. I thanked the policeman so much, what a kind man he is and I am really genuinely thankful, may Allah blesses him and all kind policeman for making the world a better place. 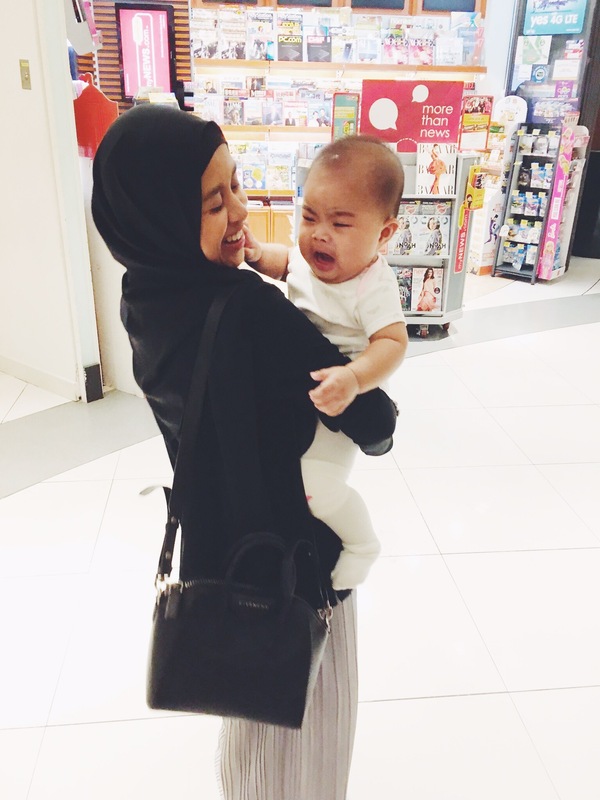 Crying when held by mami Sarah… cranky lil girl! This is how it looks like when she cries! Language freak. Striving to be a better person in dunya and akhirah.